Here you will find air quality meters, designed to measure and detect air velocity, pressure, ATEX areas (gases), temperature, humidity as well as dust. 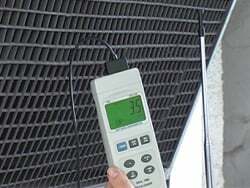 Depending on the typ e of application, air testers are made as hot wire air testers or pocket weather air testers, all of which can measure air velocity and air pressure. The results of measuring the air velocity can be stored in the memory of the device depending on the model. There are more than 25 air testers available. They are ideal for taking both quick and constant measurements. You will find a suitable air testers for whichever application, you require, from monitoring ventilation installations to checking wind speed for nautical enthusiasts. Accessories are also available along with ISO certificates for these instruments (information: calibration of air testers). Here you will find a table with wind velocities and an approximate classification. If you have any questions in regards to air testers, call us on: UK customers +44(0) 23 809 870 30 / US customers (561) 320-9162. Our technicians will be happy to assist you about these device or any other measuring instrument we have available. 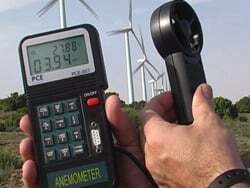 Some air testers, for example, the PCE-007 have internal memory and can transfer the data to a computer for further evaluation and analysis by means of an RS-232 cable and software.